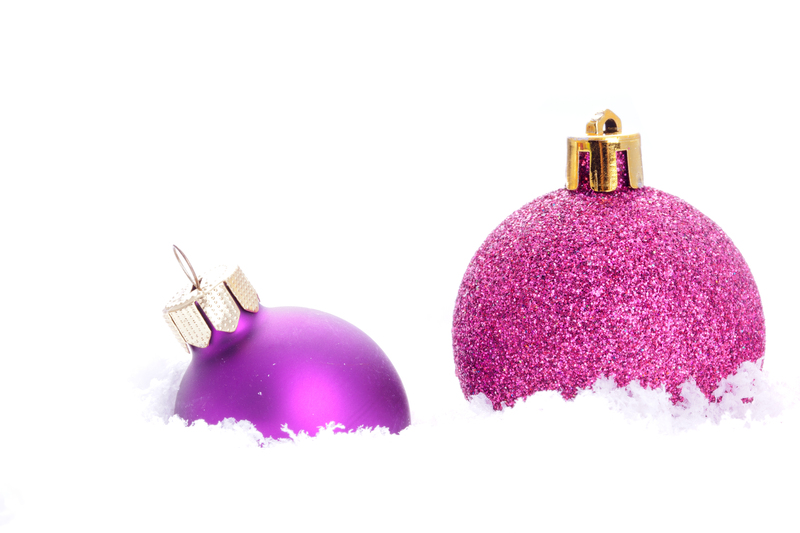 Give The Gift Of Pain Relief – Vouchers! If you are as organised as us, you will still have some tricky last minute presents to buy. No one likes taking a trip to Westfield and the internet has been trawled to death. We know that 9/10 people benefit from osteopathy and 10/10 should benefit from sports massage (and you are receiving this email because we think you agree! ), so why not buy your loved ones a session with one of our experts? Pick whether you want to buy a certain amount, a certain treatment and we can send you the voucher to write your own card with or we can send your voucher straight to your recipient. You choose. Simply email us or call our reception team on 02076104090 to buy a voucher over the phone and we will do the rest! In the meantime, we hope you are eating lots of delicious mince pies and opening those advent calendars with increasing excitement – we know we are! After last week’s sobering list of things that can happen when you sit for too long, here we are with a lovely pictogram of what you can try, no special equipment (apart from a swiss ball) needed. By challenging your balance while you sit you may be able to fool your brain into thinking you are doing ‘proper’ activity. If you don’t have a swiss ball to sit on, try getting yourself a wobble cushion for your desk chair, or a very bouncy cushion to sit on and try maintaining your position using your core. Your hip flexors get very tight when you sit so make it a priority to stretch this muscle group for a minute for every hour you sit down. What better solution to sitting too much than simply get up and move around? TV commercials, making tea or refilling a water bottle, bathroom breaks, switching lights on can all be an excuse to get off your bottom and simply move your body! This is a luxury not many people have, particularly at work, but standing at your desk instead of simply sitting can have a hugely positive effect on your wellbeing, from improved circulation to less joint stiffness. This is simplified and generally any form of activity that encourages joint and muscle stretching such as pilates or yoga can vastly improve your general flexibility, muscle tone and joint mobility and ultimately your overall sense of health and wellbeing. This article was shared from the archived work of Bonnie Berkowitz and Pattison Clark who interviewed leading biomechanists, National Cancer Institute investigators (US) and the inventor of the treadmill desk in Arizona. If you are struggling with any aspect of your health, get yourself booked for your treatment with us here, now, we like helping! Muscles weaken and blood flow slows, which allows fatty acids to clog the arteries of the heart more easily. Prolonged sitting has been linked to high blood pressure and raised cholesterol, and people with the most sedentary time are more than twice as likely to have heart disease than the most active. Moving your body causes fresh blood and oxygen to pump nicely through the brain and trigger the release of all sorts of brain- and mood-enhancing chemicals. When we don’t move enough, everything becomes sluggish, including brain function. The pancreas produces too much insulin as the muscles that normally respond to it become resistant to it, which can lead to diabetes and other diseases. Studies have linked sitting to a greater risk for colon, breast and endometrial cancers. There is not enough evidence to say why, but one theory is that excess insulin encourages cell growth. When you stand, move or hold any position at all, abdominal muscles keep you upright. But when you slump in a chair, your abdominals switch off. Muscles in your back then tighten and when combined with your mushy abs will reek havoc with your posture that can exaggerate the spine’s natural arch, leading to back pain and beyond. If you sit for prolonged periods your hip flexor muscles very rarely get the stretch out they need. Without this they become short and tight, limiting range of motion and stride length. Sitting requires your glutes to do absolutely nothing, something they get used to very quickly. If your gluteal muscles aren’t strong enough you will likely have reduced stability around your pelvis and by extension your feet and legs. Sitting for long periods causes fluid to pool in the legs. Problems range from swollen ankles and varicose veins to dangerous blood clots called deep vein thrombosis (DVT). Weight-bearing activities such as walking and running stimulate bones in your legs to grow thicker, denser and stronger. Craning your neck forward toward a keyboard or tilting your head to cradle a phone while typing can strain the joints of the and lead to imbalances in muscle tension, intervertebral disc hydration and joint flexibility. The neck doesn’t slouch alone. Slumping forward over stretches shoulder and back muscles as well, causing them to ache and feel stiff and sore. When we sit for a long time, discs are squashed unevenly. Collagen hardens around tendons and ligaments, leaving us feeling stiff and un-youthful! 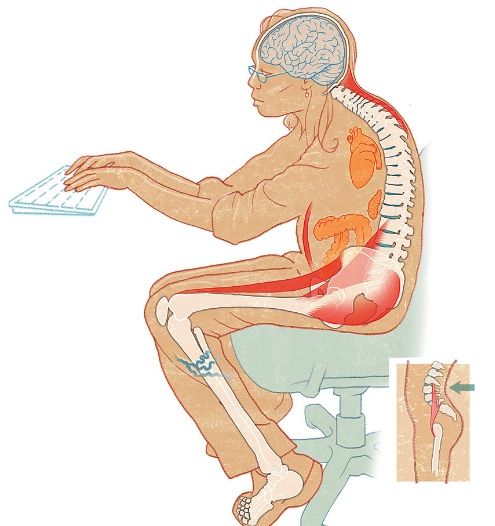 People who sit more are at greater risk for herniated lumbar disks. When we move, the discs between vertebrae expand and contract like sponges, soaking up fresh blood and nutrients. But when we sit for a long time, discs are squashed unevenly and the collagen fibres that make up the walls of the discs to lose flexibility and leaving them vulnerable to tearing.